Compact bootle and breast pump or dummy steriliser does a good job but water leaks everywhere need keep cleaning and another problem with limescale apart that seems to be ok.Giving as a present but will not buy again. As a first time mum, with no clue on how to sterilise my bottles effectively and quickly. This wonderful steriliser is quick and compact, sterilising bottles in under 10 minutes. Even though compact, I manage to fit 7 of the Avent 260ml bottles at one time, even pop a few dummies in the top tray. The only down side is that the water tray that heats up looks burnt, and sometimes smells burnt. However it doesnt affect the bottles, and the machine still works fine. It washes down nicely, overall a wonderful product that I can not stop recommending to other mums! Compact, doesn't take up much space, great if you have a small kitchen! All in all, I was pretty impressed with this product, convenience with not having a big kitchen and I got it for a good price. Easy for storage, and easy to use! This is great if you need a compact steraliser as rather than being wide like the majority of steralisers, this is tall and thin. I bought it as part of a set with the Avent bottles however we did not agree with them so we switched but my bottles still fit in. I now manage to fit 6 tommee tippee bottles in at once which is great as I can steralise my bottles for the day. The downside to this product is that it leaks each time when used and I have a puddle on the worktop that I have to clean. I also have to descale it quite often however this is not too much of an issue as I have read other reviews for similar products which state the same. If you are sterilising breast pumping parts and 6 bottles and couple of soothers it’s a jigsaw to get everything in! Haven’t used any other steriliser so can’t compare, but find it frustrating how frequently I end up descaling but that isn’t Philip agents fault that’s the water where I live! 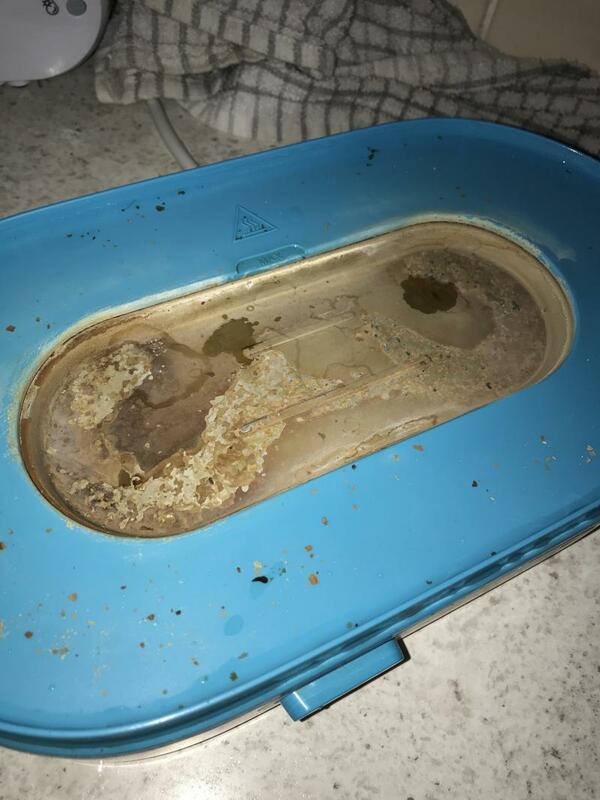 Limescale builds up in water tray you need to keep cleaning this all the time. 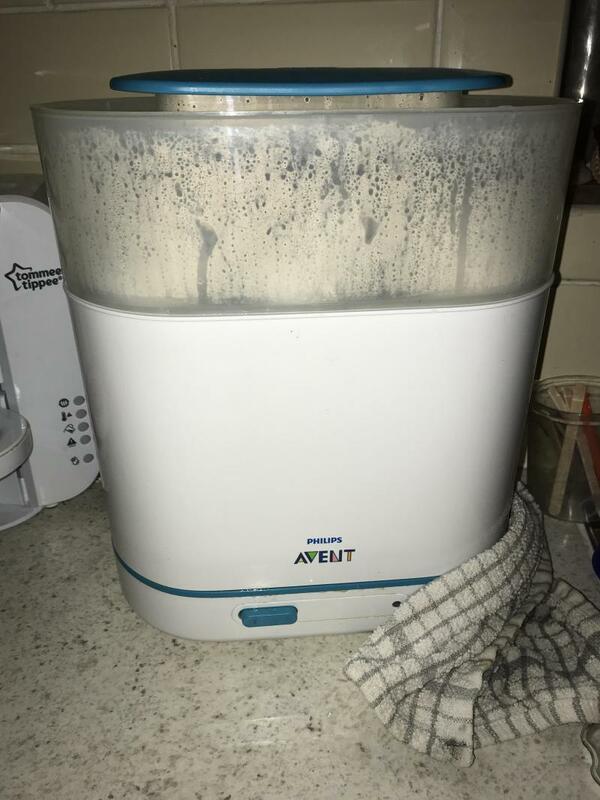 I always trust Avent and was very pleased with this electric steriliser. It looks great and doesn’t take much space on the kitchen worktop. It does sterile the bottles in 10 minutes and then it’s best to clean the whole steriliser straight away to avoid limescale in the bottom tray as well as the plastic parts. I would recommend it. Oh and another downside is the short cable. 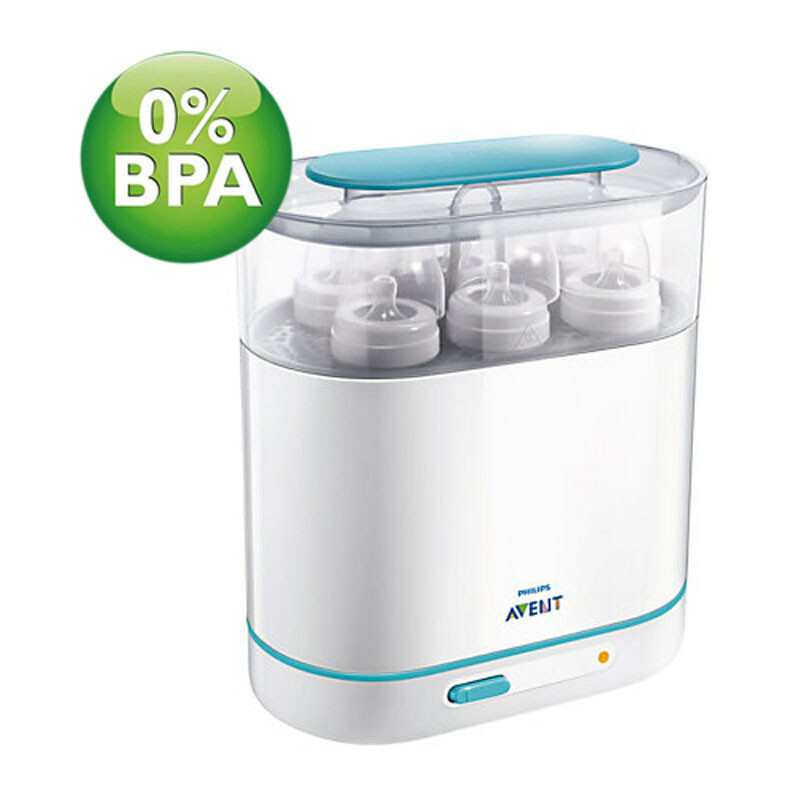 The Avent 3 in 1 steriliser is an all round great product. Easy to use and has bottles stesalised in 10 minutes which great. Room for 6 bottles and 4 soothers. Would highly recommend to any expectant mother and new parents. Slim build and fits a lot in. Mine did limescale quite a bit at the bottom. 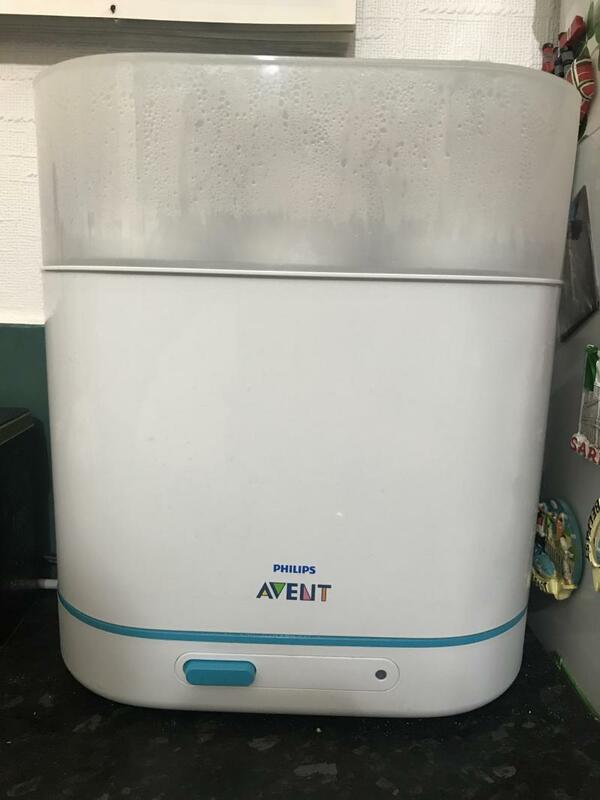 Lovely steriliser, definitely did the job and could fit enough in, I’d very slim build so doesn’t take up much room only problem I had was the limescale but apart from that would definitely recommend. I wanted a large enough but compact steriliser which i could push against the wall when needed as opposed to a round one like many on the market. I really like the design and it does feel compact as i can push it against the wall when not in use even when it is fully assembled. So far I have used it to sterilise bottle (can 6 at a time), dummies, powder dispenser pots and breast pump equipment, i can't really imagine using it in the small configuration to be honest. The water goes in the base and it is very easy to operate from first use, just push one button. It does get limescale easily and i noticed this after a few days of use even though i am in a soft water area. Also there is a lot of water left behind all over the base after use and on the bottles which can be annoying especially when you it comes to taking the different sections apart to add more water to the base as you end up with water everywhere dripping from the different parts that have been lifted. Overall good machine that does the job but slightly disappointed with excess water and limescale issues. It also leaked a lot and fitted less bottles than the previous design I had with my first born. 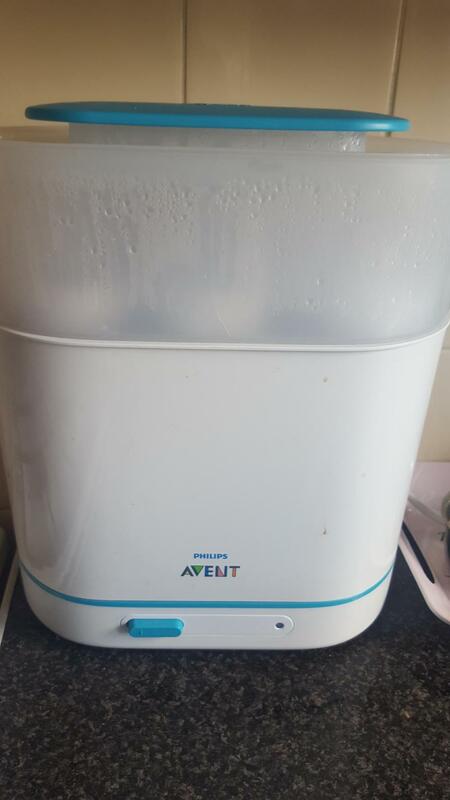 I had read some great reviews on the avent 3 n 1 steriliser and so thought I would give it a go. 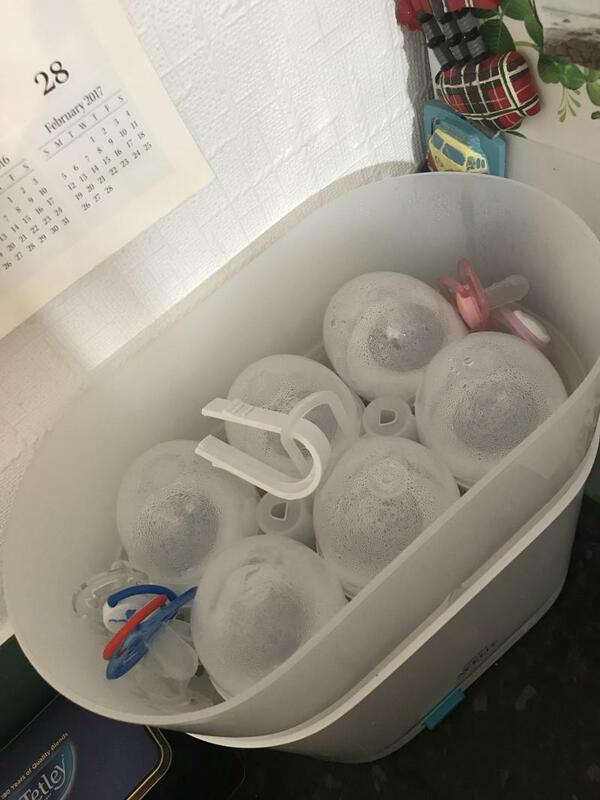 I liked the amount of space it had compared to my previous steriliser as I was using MAM anti colic bottles, which are quite large and have many different parts. The heating element is also nicely exposed so that you can see the limescale forming, which prompts you to descale. The sterilisation process is pretty speedy too, which is always handy for a busy mum who is always on the go and who has a hangry baby. Only niggle I have is that the power cable is quite short so I have to unplug every time to empty the old water content but that isn't a big deal, just me being lazy :). 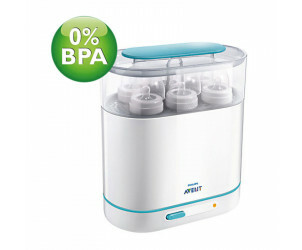 The Price is reasonable compared to others on the market and I have found it a great replacement for my old steriliser. 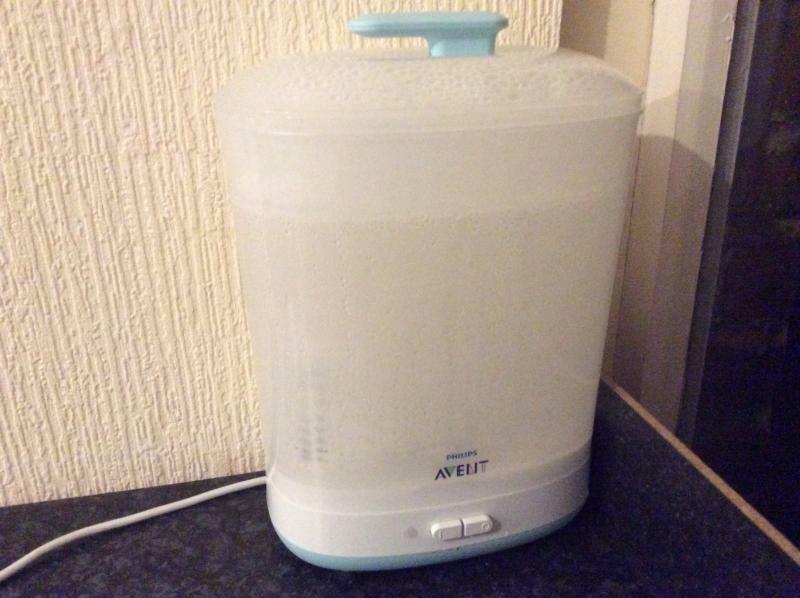 This steriliser is so easy to use, ans it fits up to 8 Avent bottles so you can clean them all in one go. It gets limescale but a little vinegar mixed with water solves it. Very handy device when you bottle feed. Highly recommended. This steriliser does work really well and looks great. However the base burnt very quickly and it does not dry the items and there’s always a large puddle of water on the work top around the base of the steriliser after use sis have to keep a tea towel wrapped around the base. As a result I have decided to buy a different brand. I really love this steriliser . It’s easy to use and it isn't too big, and it's beautiful . I really like that it has two trays, one bigger and one smaller, and can be used within only 6 minutes. It's really saves my time and it's worth the money. Easy to use, large enough to fit lots of items, quick! This product has been a life saver! It’s so easy to use, fits in lots of products and it’s quick! 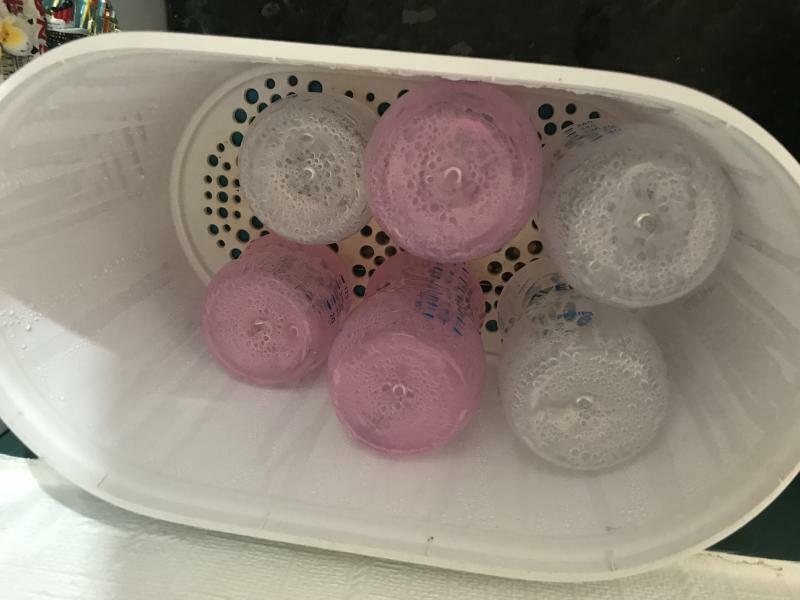 There have been so many times that I have needed a bottle quickly and have been so thankful to have this handy product which sterilises in just 6 minutes, and keeps everything sterile for 24hrs, fab! We love this product as it saves us so much time sterilising the bottles. It does not make lots of noise and is very easy to clean. However as our kitchen is very small it takes a lot of surface space, besides that does all it should. This is a great steriliser I had a tommee tippee one but baby didn't get on with the bottles he did get in with nuk but the bigger bottles were too tall for the tommee tippee steriliser whereas this one fitted all the bottles we tried... And I'm pretty sure we tried nearly every brand! Can be used as a travel steriliser! Love love this steriliser . It’s easy to use and does not take loads of space in the kitchen . Love the fact it has two trays and can be used within 6 minutes. I have used this as a travel steriliser as it can be compacted down. Great design to fit amongst other kitchen goods and also serves it's main purpose on a daily basis. This product is brilliant for what it does, it holds 6 large bottles meaning it has plenty of room to sterilise other items. It fits nicely in our kitchen too as it's design is perfect. Although it has some downsides, the hot plate underneath burns very easy and I am still to find a way of removing the burn as it leaves black bits in the bottom of the steriliser. Overall this is a minor issue to me and I would most definitely use again. I love the Agent products, but I wasn’t mad about this. I found that the water plate leaked all the time and even turned rusty. I’m definitely one for ensuring that when I clean something, I take all the components apart and let the air get to them. Despite my best efforts, I wiped this down after every use but it still turned rusty. I decided not to use it anymore for fear the rust would be going into the hot steam and onto my baby items. I bough this to replace my tommee tippee steriliser which I had to send back, this although take 10 minutes to sterilise instead of 5 is great, the tall chamber is great for the bigger mam bottles that we use, but a bit hard to fit all the components on, but it’s so easy to fill and clean. We bought this steriliser after our microwave one just wasn’t big enough to keep on top of all the bottles. It has 2 trays to separate bottles, teats, soothers etc and can fit at least 6 bottles. It is so easy to use too. Put in water, switch on, done in. 6 mins. The only downside is after only one or two uses the water tray (which is metal) looked tarnished. We cleaned it with vinegar but after another use it was back to lookong tarnished. It does require cleaning more regularly that you would like. Small: Ideal for sterilising accessories like soothers and teats. Medium: Perfect for breast pumps or toddler feeding utensils such as plates, bowls, spoons etc. Large: Sterilise a full load (holds up to six 330ml bottles + accessories). Sterilise contents in only 6 minutes. Once the cycle is finished, the steriliser automatically shuts down for safety and energy saving. Contents will remain sterile for up to 24 hours if left unopened, ideal for overnight feeds.